The two engravings are both attributed to N. Orr of "N. Orr & Richardson, S.C., N.Y.," and yet they bear interesting differences in the representation of the subject. Not only is the likeness visibly different in each, but so are subtledties in the bearing, stance, and attitude of "Gopher John." What accounts for the differences? Surely more than the degeneration of the engraver's block was involved. Given that Orr completed both engravings, one could suppose that he would only have made substantive alterations to the later engraving (at right) with directions either from the author, Giddings, from new source material, such as a sketch alleged to be from life, or on the authority of someone who claimed to know John Horse's likeness, such as a military officer from the Florida war. The last two possibilities are especially likely given Orr's track record by 1858, having engraved a number of Seminole subjects for both the Sprague and Giddings histories. 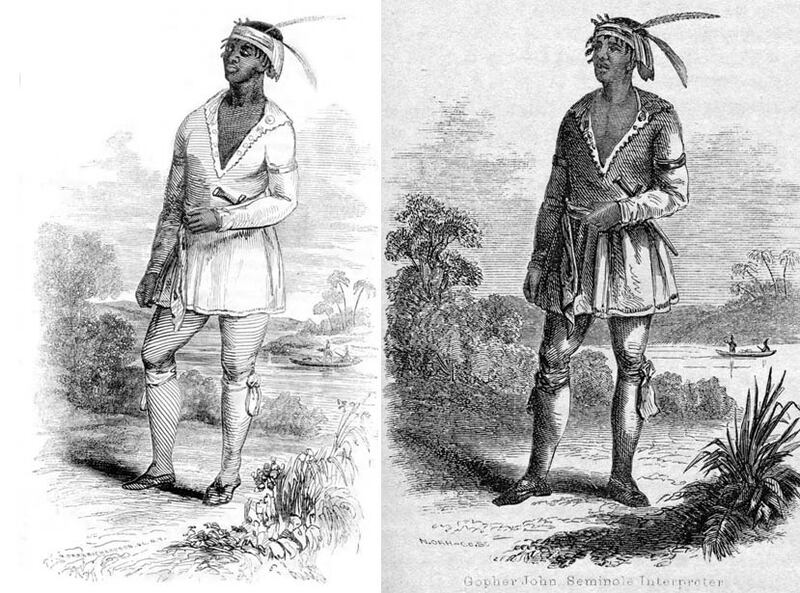 Images: At left, Orr's 1848 engraving of John Horse for Lt. John Sprague's The Origin, Progress, and Conclusion of the Florida war. At right, Orr's engraving for Joshua Giddings' 1858 history, The Exiles of Florida.